This was my first thought. We only spent $3M more for a slight upgrade. Couldn’t be happier with the offseason now. I like this signing a lot. Cutting Ayers was the right thing to do. Offered no leadership last year. Curry was able to put pressure on the qb. Had a consistent motor and was good against the run. We need that. Not the stud DE people wanted but he’s good. I’d rather have 3-4 good edge rushers than 1 stud and 3 flops. If noah Spence can recover and stay healthy, let’s add another body to the rotation via draft. 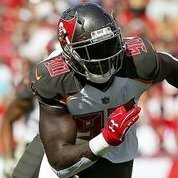 We might be solid for 30-35 sacks and atleast set qbs off their throws. DE depth still isn’t good. Curry is an upgrade over Ayers but we need to come away with a third DE. One that can either start or come in the rotation and provide a spark.